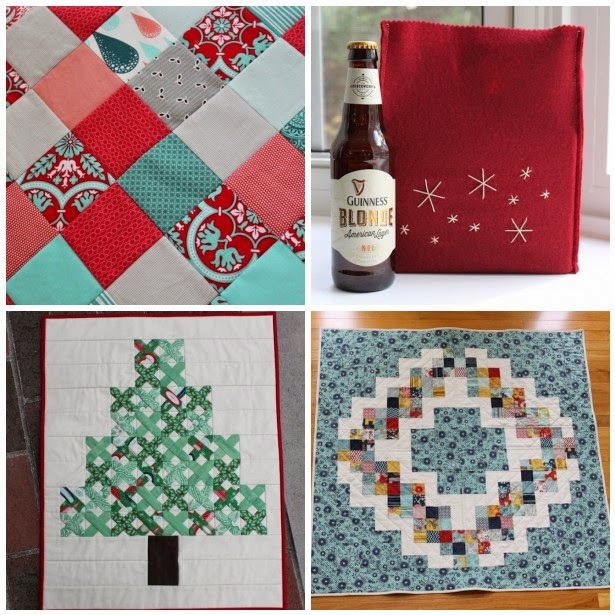 It’s fun to see what resonates with blog readers, and the top post was the six-pack gift bag tutorial. My response to that? Bwahahaha! 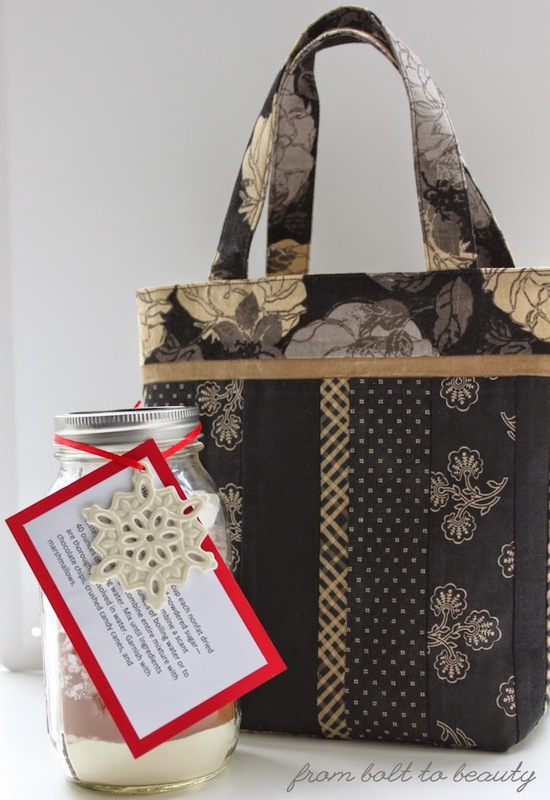 I think the gift bag is popular because it’s unique, it’s easy and attracts a variety of crafters, and it appeals to men, who tend to be overlooked in the craft world. And countless broken promises to use my stash instead of purchasing more fabric—alas! Whatever the journey that is 2015 brings, I’m happy to have you as a traveling companion. Happy new year! It’s December 22, and my sewjo is waning. I’ve barely touched my sewing machine in the past week. I’ve cleaned and cooked and hosted (the first wave of holiday guests has already come and gone). I’ve wrapped and tagged and bagged. And I’ve napped, thank you very much. The quilted tissue holders I became infatuated with earlier this fall have multiplied and will go to the staff at my younger son’s preschool. You do the math: 25 for them + 2 for me = a crazy number of tissue holders! Accompanying the basket of these cozies is a note from my 4-year-old. He adores the educators at his school. The feeling is mutual: I honestly think some of them hope that I won’t show up at pickup someday so they can take him home themselves! And then there’s the Sew Together Bag I conquered most recently. 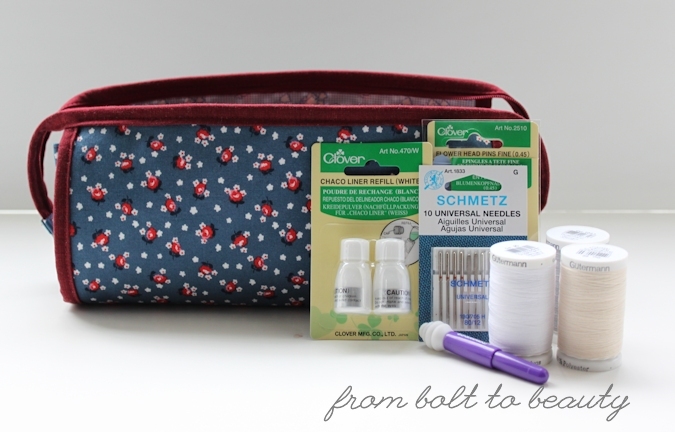 I’ve filled it with sewing-related goodies—needles, thread, extra Chaco chalk (but not yellow! ), pins, and more. It’s under the tree and ready to be gifted to my mom on Christmas. This may be my last message for this year, so I wanted to wish you all an amazing Christmas! Big blessings to you in the new year! Honestly, it was no big deal. I wouldn’t recommend a new sewer try it—sew some easy-peasy totes first. But if you know your way around your machine and have a walking foot, you can do this. 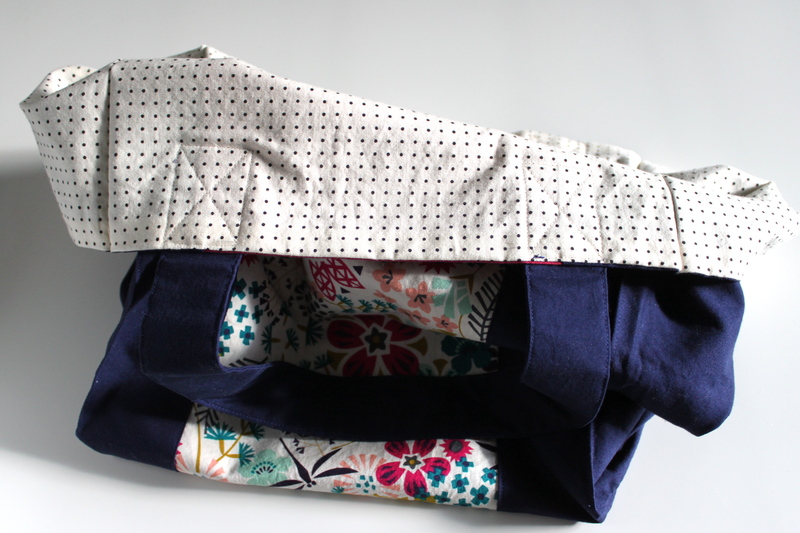 For some context, I’d say that it’s more complicated that the pouches and totes that I’ve blogged about thus far; it’s not even close to the complexity of the Amy Butler Cosmo Bag I made. No, the pattern isn’t difficult—but I sew my best with lots of visuals, and this pattern has few pictures or illustrations. 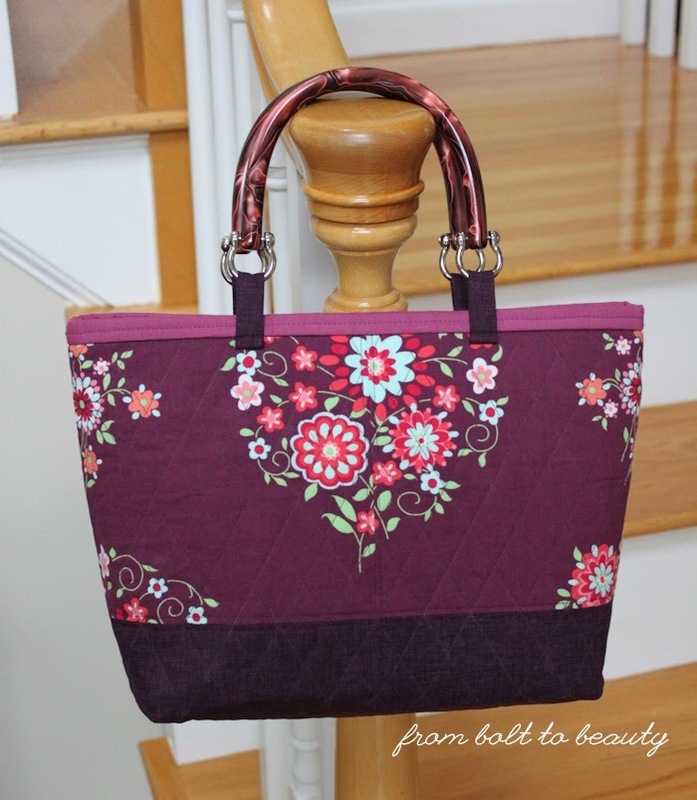 Go to Quilt Barn’s Sew Together Bag sew-along for more step-by-step pics. It’s a sanity saver. Based on advice from other sewists, I used thin strips (⅛” wide) of Pellon’s 805 Wonder-Under on the lining panels of the bag (B1, B2, B3, and B4) to adhere each panel to its corresponding zipper(s). (There are other comparable products that would work just as well; I happened to have Wonder-Under on hand.) Then I pinned the pocket lining on top of the lining panel and zipper. I thought everything stayed together well as I sewed. There is so much fabric! Yes, you have to sew through some bulky chunks to construct a Sew Together Bag. I used my walking foot throughout the process. (I did not use my zipper foot at all; I couldn’t get everything through my machine without my walking foot.) I also used size 14 or 16 needles. (I started with a 14 and moved to the 16 when I had to attach the side panels.) And I trimmed the interfacing on the lining panels (B1, B2, B3, and B4) smaller (8¾” x 9¼” instead of 8¾” x 9¾”), based on this advice, so that there would be one fewer layer in the side seams. I’m not sure whether it really helped, but I would do a second bag the same way. The funny thing about the Sew Together Bag is people never make one. I think I know why. It goes together more easily than you think it will. And once you have a first under your belt, a second isn’t intimidating at all. Plus, there’s the novelty factor. 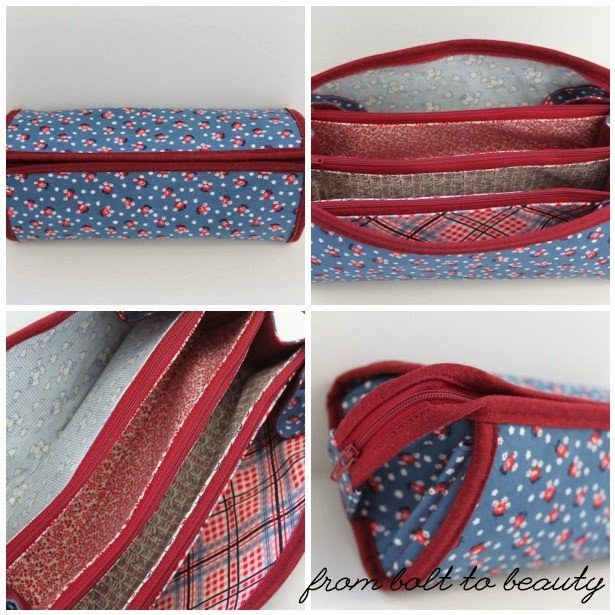 It doesn’t look like other bags or pouches out there, and it makes a great gift. After all, what says “I love you” more than four zippers?! A postscript on the fabrics: The exterior fabric is DS Quilts; the binding is Quilter’s Linen in garnet; the interior fabrics are Denyse Schmidt, Marcus Brothers, and Aunt Grace, some of which have been in my stash for longer than I care to admit. 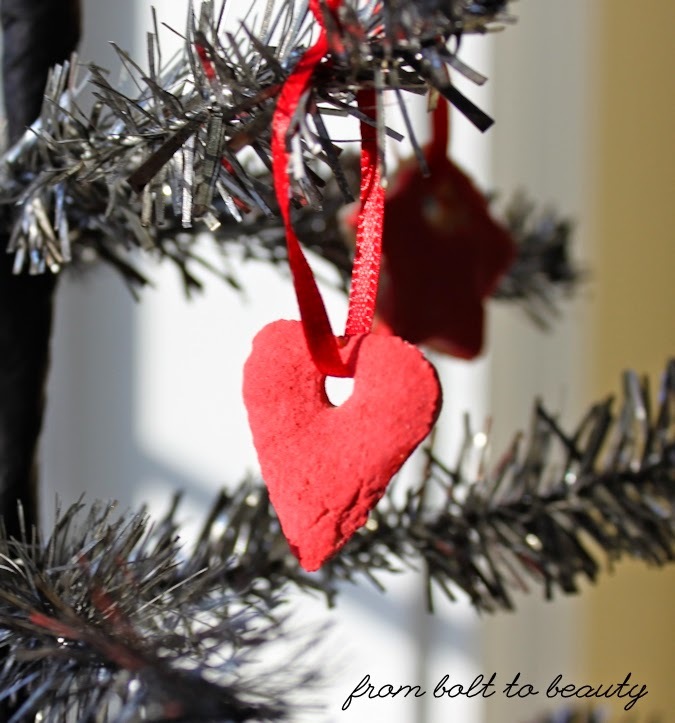 And I wanted to extend a big thank-you to everyone who entered and to those new followers who are giving From Bolt to Beauty a test-drive. I knew that giving away a cool prize would be fun, but I didn’t foresee how much I’d enjoy reading the comments. I’m still working my way through them, having decided early on that I wanted to respond to each one. How could I resist? 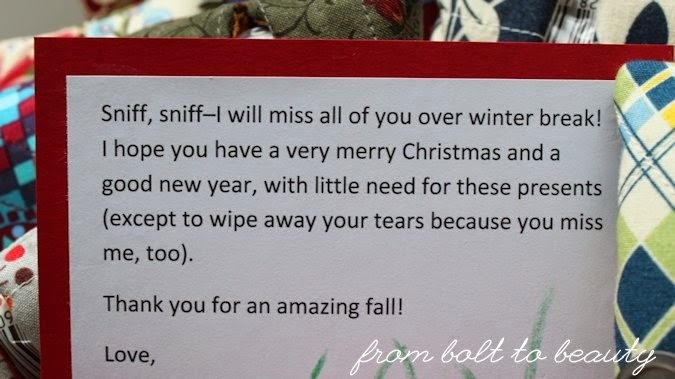 Hearing what everyone had to say about their expectations for the new year made me feel the same way I do when I leave a guild meeting: These are my people! 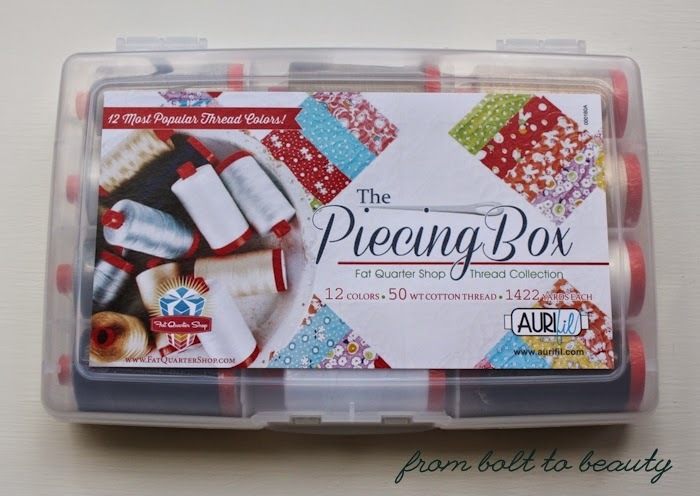 I went so long without taking part in a sewing community. Now that I have crafty connections—both in person and online—I can’t imagine being without them. One final thought: If you’re a blog reader who doesn’t comment on posts—whether here or elsewhere—can I make a recommendation? Start commenting. I lurked in the shadows of the blogosphere for years, thinking I was getting everything out of it that I could. But things changed when I began commenting. Truly, you have more insight and experience that is worth sharing than you think! OK, I have a quilt to baste! Good luck with your holiday to-do list! The postponed quilt is for my sister. She would understand if I presented her with a pieced quilt top on Christmas day with an IOU for a finished quilt, but I thought she needed something tangible to tide her over. So I made her a Mini Miranda Bag. Eep! I love it! It’s so darn pretty, don’t you think? I pulled the Amy Butler floral and the eggplant Quilter’s Linen from my stash; both were left over from my Cosmo Bag. I had the Clover handles on hand as well. (Bonus points for using my stash!) All I had to buy was the Kona Plum that’s visible as the faux binding at the top. Time is ticking. Just 15 more days until Christmas. I hope I can meet my new-and-improved goals! Have you had to revise your holiday to-do list, too? 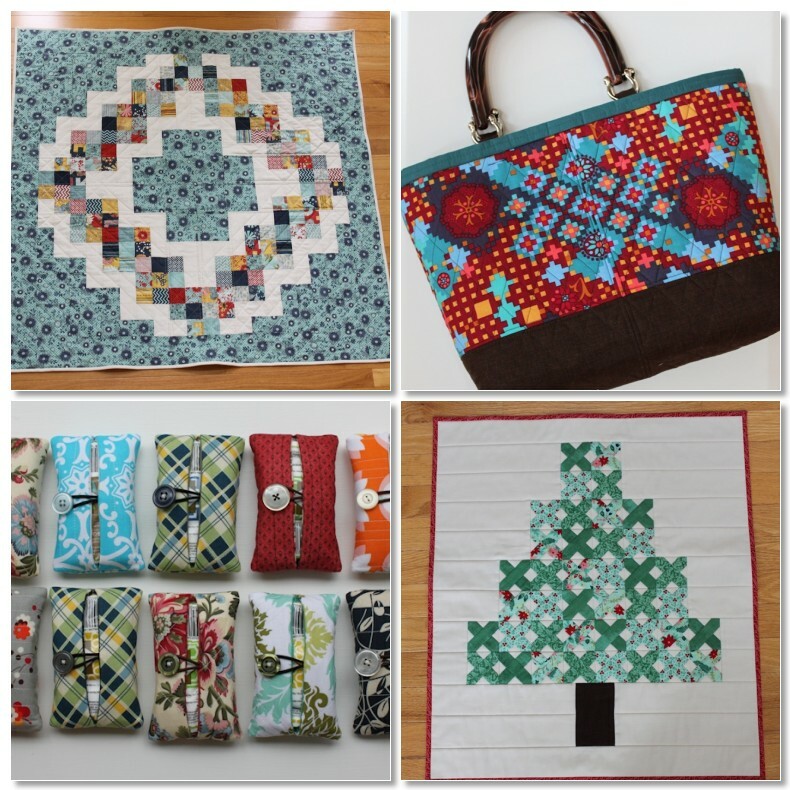 Sew Mama Sew's Giveaway Day! 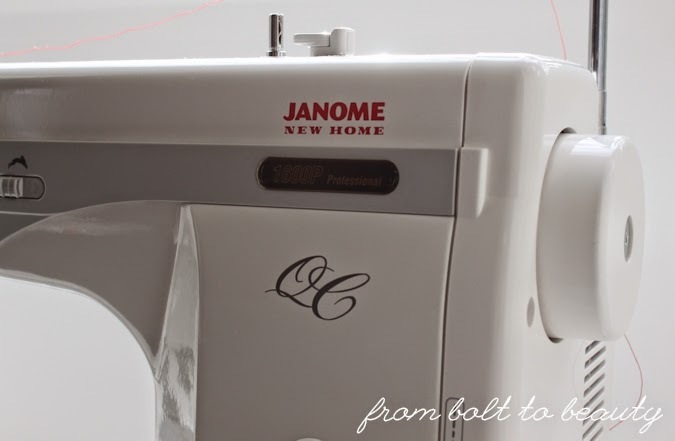 Welcome readers of Sew Mama Sew! 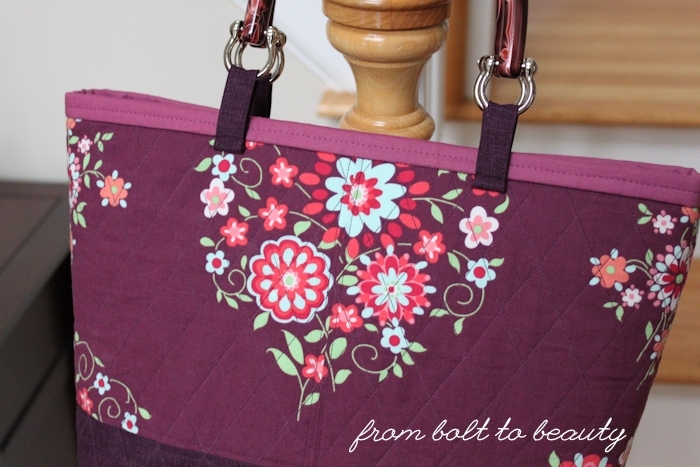 You’ve landed at From Bolt to Beauty, a crafty corner of the interwebs where I chronicle my sewing and quilting adventures. • I love Quilter’s Linen. I really love Moda fabrics. And I really, really love Denyse Schmidt’s designs. • I avoid hand-stitching at all costs. • I have an unnatural fear of Clover’s yellow Chaco Liners. But I suspect that you’re really here to learn about winning this fabulous set of Aurafil thread. 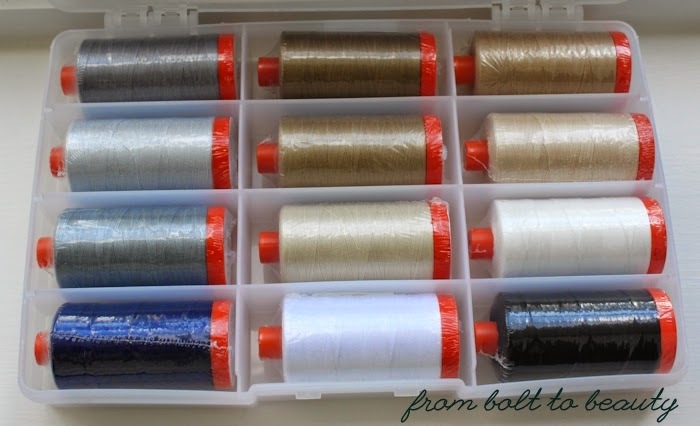 It’s 12 large spools—1,422 yards each!—of the most popular thread colors. This giveaway is open to anyone anywhere in the world except the woman who gave birth to me (because, Mom, it’s against the rules of giveaways; I’ll make sure Santa hooks you up if you want some fancy thread). For a first chance to win, leave a comment, telling us what one sewing-related resolution you hope to keep in the new year. I, for one, plan on getting proficient at free-motion quilting. For another chance, leave a second comment, indicating how you follow me—on RSS, Bloglovin’, Instagram, etc. This giveaway is open through Friday, December 12 at 8 p.m. eastern time. Mr. Random Number Picker will select a winner. I’ll post the winner here and email him or her. Good luck! We quilting bloggers like to write about the techniques and skills that go into the creation of our quilts. I know that I approach my quilt making as an art, and I’m happy to tell anyone who is willing to read my blog about it! At the end of the day, though, I’m making a blanket. I see quilting as a utilitarian art form. I have never sold (or tried to sell) any of my quilts. 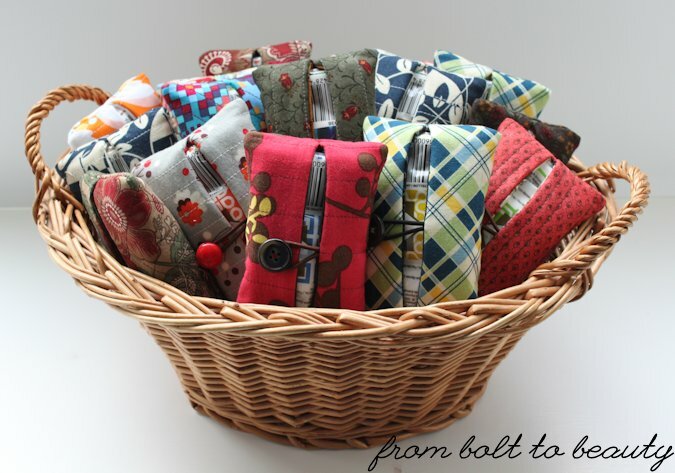 All of them either live here at From Bolt to Beauty world headquarters or have been gifted to a friend or family member. As a result, my quilts are just as much about the recipient as they are the creator. With that in mind, I want to tell you the story of quilt #3. 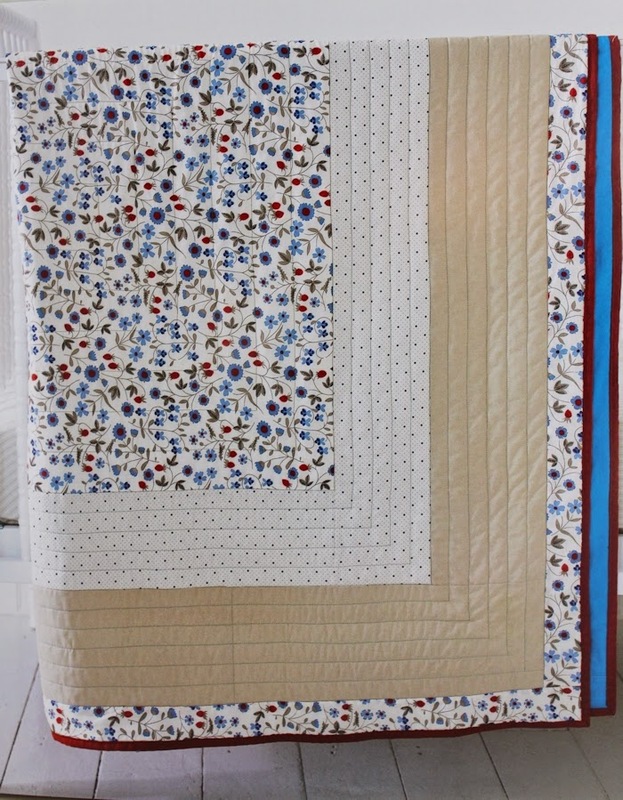 In the spring of 2013, I decided that my friend Miss L needed a quilt. This present would be both unexpected and meaningful. The problem with this plan, however, was that I had never made a quilt before. I marked the quilt with my trusty white Chaco Liner, from Clover, and a yellow version of the same tool, which I had bought specifically for this project. I love Chaco Liners. I find them easier to work with than white pencils or Hera Markers, and I never had a problem with them until I washed this quilt. I did not follow the manufacturer’s recommendation and test the yellow Chaco Liner before use, and it washed out of the floral print but not the Zen Chic fabric. I was devastated. I did unspeakable things to that quilt in attempt to remedy the situation. I used commercial stain removers. I used a homemade hydrogen peroxide mixture. By the end, the yellow lines remained, and due to my interventions, some of the colors in the floral had begun to bleed. Sigh. Here’s the thing: I gave the quilt to my friend anyway. It didn’t meet my expectations as the product of my creativity, but it still had a purpose to serve. The heinous yellow lines did not affect its performance as a quilt! Plus, I made this quilt especially for Miss L. It was an expression of my love for her. Keeping it for myself because it didn’t turn out as planned was not an option. Granted, I was too heartbroken to take a picture of the quilt. It doesn’t appear in my list of finished quilts here. But my friend was clearly touched by this gift, and that eclipsed the mishap with the yellow Chaco Liner. So there was a happy ending after all. Actually, there were two. 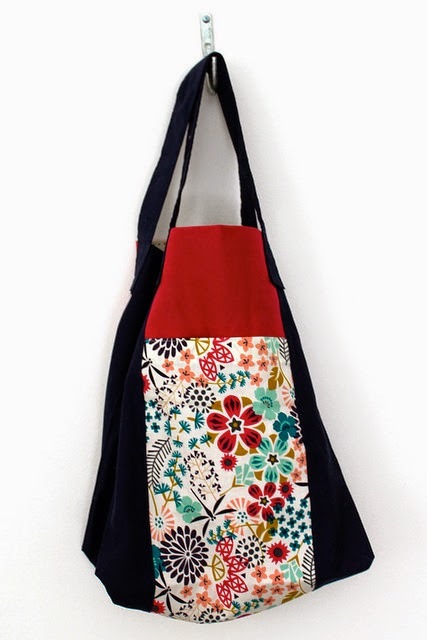 I had enough scraps for a tote bag, which I gifted to another friend just recently. I didn’t know at the time, but this friend was having a rough spell. (Children + illness = long days for mamas!) I could have buried both the yellow-marked quilt and remaining fabric bits at the bottom of my fabric stash. I’m happy, though, that I followed through with gifting the original quilt project and then made a second project that features the same lovely fabric combination. Amy, over at 13 Spools, recently encouraged her readers to embrace their mistakes. The example she gives, however, is more of a design decision that she ended up disliking. Mine is more of a marking-tool malfunction, a mistake that could have been avoided. Can you relate to one or the other? I’d love to hear your experience along either vein and how you handled it! First off, the winner of the PDF copy of Meadow Mist Designs’ Looking Glass pattern is mfhagopian. Congratulations! I’ve sent you an email with your PDF. It’s amazing what you can accomplish when you’re avoiding a tough task. And by that I mean, it’s amazing what I can accomplish when I’m avoiding learning how to free-motion quilt. My mother-in-law asked that I make her a quilt, and when I saw a version of this one on Instagram, I thought it fit the bill. I needed something that would work in a formal, more traditional décor with an Asian flair. 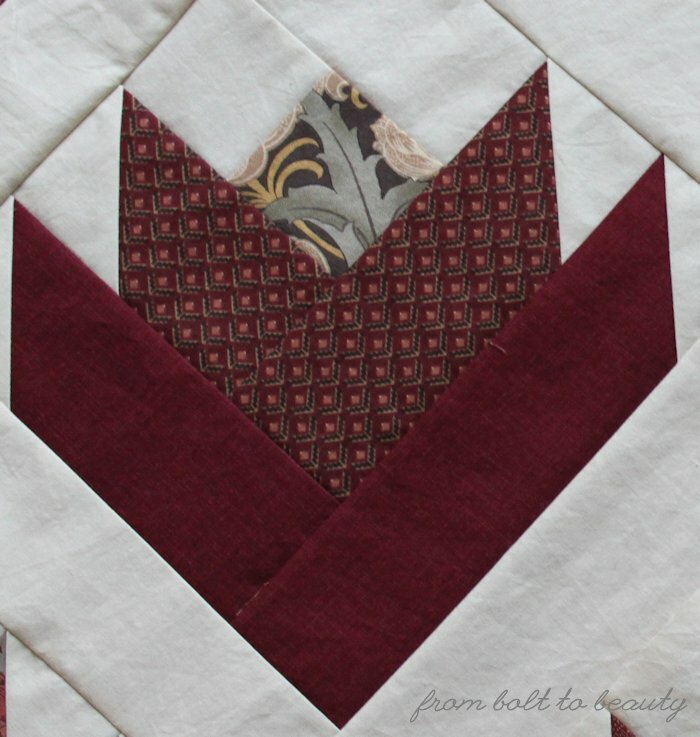 With the help of Corey, of Little Miss Shabby, and Dorie, of Tumbling Blocks, I managed to track the pattern down to Pam and Nicky Lintott’s 2008 book, Jelly Roll Quilts. The version in the book, as well as those by Corey and Dorie, have a scrappy feel to them, which doesn’t suit my mother-in-law’s taste. I chose to incorporate fewer fabrics and use matching fabrics in each layer of the flower. Doing so, I think, instantly makes it a more tailored quilt. What’s your knee-jerk reaction? How would you quilt this one?